Looking for some good cardio workout routines? Whether you're just starting out or have years of experience, it's always nice to shake things up and take on a fresh challenge. Here are some ideas for getting started, one for the outdoors and one for when the weather is less than ideal. As a beginner, your foremost priority is to get your body used to regular exercise, prevent injuries and generally getting into the groove of things. That means keeping things safe and simple until you're ready to move up to the intermediate level. Warm up and stretch properly, then jog for 30 minutes if you can, otherwise alternate between walking and jogging. You're supposed to be huffing and puffing, but not exert yourself to the point of seeing spots and worrying about a heart attack. Once you're done jogging, do a few sets of abdominal crunches, push ups and, if a bar or suitable tree branch is available, a few pull ups (chin ups). The stationary bike is such a staple it barely needs an introduction. If you're lucky, your gym has the new generation of virtual reality exercise bikes, which can significantly reduce the dullness normally associated with indoor cardio. If not, you can still mix it up by splitting your time between a stationary bike and a rowing machine for a full-body workout. Aim for 15 to 20 minutes on each, after warming up properly. After about a year of regular exercise, you might be ready to move up to the next level. This is the stage where you can start really challenging yourself. 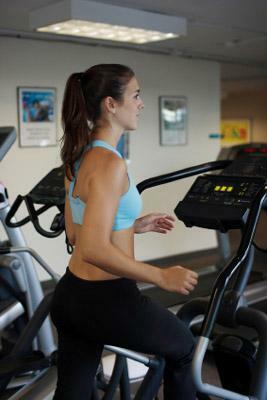 If you belong to a health club or gym, you can also get excellent cardio workouts there. Step on an elliptical trainer that simulates the running motion, except there's no point of impact rattling your skeleton. Most better elliptical trainers are also adjustable to simulate uphill climbs and other situations, making for more varied training stimulating different parts of the leg. After warming up and stretching, set it to 30 minutes, adjusting the angles every ten minutes with at least three 30-second, all-out sprints (adjust resistance) per setting. Finish with the same 10 minutes of circuit training-type exercises as Routine 1. Naturally, these are only a few potential cardio workout routines that may or may not appeal to you. The key to making the most of your efforts is to incorporate elements of anaerobic training (explosive training) with your aerobic training (endurance training). By throwing in some push ups, interval sprints, leaping lunges or whatever you like, you effectively hike the metabolism for better fat burn as well as build better all-round fitness. Also, don't forget to cool down and stretch properly afterwards. Not only does this combat soreness, it also prevents muscle shortening and creeping inflexibility that could potentially cause imbalances and injuries down the road. Good luck!